Convention Center - World Record Hot Dog. Ready To Taste the 145 foot hot dog by using 2 slices of bread, for each person, - while Malecki Pres. readying the relish. The hot dog is residing at the Niagar Hilton under guard. 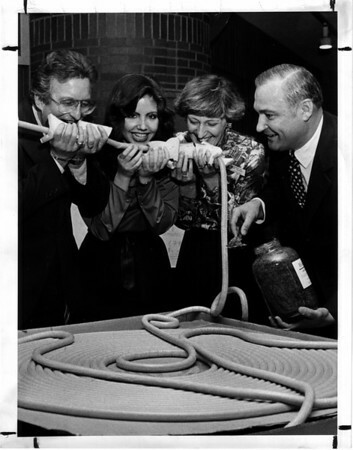 From left to right - Frank Roma - Tourism Co-ordinator for I Love N.Y. Committee, Christa Mauro - 1982 Niagara Falls Experience Chairman, Carol Voutour - Administrative Assistant - Niagara Hilton Hotel, and F. Ronald Malecki - President of Malecki Sausage Company. Photo - By Andrew J. Susty - 2/3/1982.